Information and Library Network (INFLIBNET) Centre is an autonomous Inter-University Centre of the University Grants Commission (UGC) of India. It is a major National Programme initiated by the UGC in March 1991 with its Head Quarters at Gujarat University Campus, Ahmedabad. Initially started as a project under the IUCAA, it became an independent Inter-University Centre in June 1996. 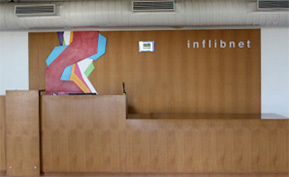 INFLIBNET is involved in modernizing university libraries in India and connecting them as well as information centres in the country through a nation-wide high speed data network using the state-of-art technologies for the optimum utilisation of information. INFLIBNET is set out to be a major player in promoting scholarly communication among academicians and researchers in India. Copyright © 2019 INFLIBNET Centre, Infocity, Gandhinagar-382 007, Gujarat, INDIA.